Wadi Rum Nomads is a company based in Rum village. In the heart of the protected area of the majestic Wadi Rum desert in Jordan. The company is owned and managed by me, Fawaz Mohammad Al-Zalabieh. We offer our guests all kind of tours and overnight stay options in Wadi Rum. Ever since I was a little boy, I dreamed of having my own tour company. As a youngster of 12 years old I started to work with my uncles. First I looked after the camels. Later I worked as a cook in the camp. As my English improved, I started to work as a camel guide. After a while I switched to guide jeep tours, hiking and scrambling tours and trekking. Over the years I got very experienced in guiding travellers. Providing them with whatever they need to have a wonderful time. And I learned everything that an excellent guide needs to know about the sites and history of Wadi Rum desert. I also spend a lot of time with my grandparents. 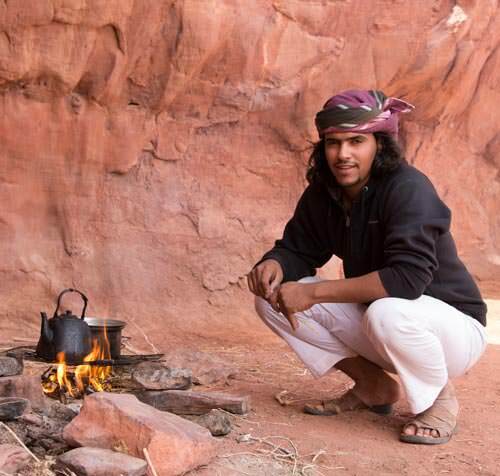 Often we sit next to the fire, talking and sipping from another glass of Bedouin tea. They tell me a lot of stories; stories about family, Bedouin life, culture and history. They enrich my knowledge in a unique way for which I am forever grateful. To me, it is essential to pass this legacy within our family. And I also wish to share it with the travellers who visit us. 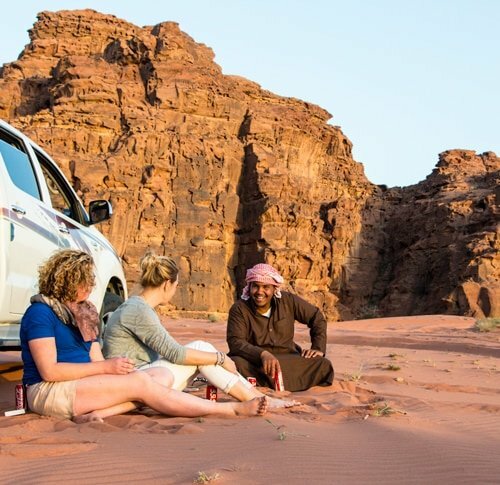 Wadi Rum Nomads is a family business. My brothers Abdullh, Nawaf and Habis, cousins and friends guide tours for Wadi Rum Nomads. We are proud Bedouin from the Zalabieh tribe who live in Rum village and Wadi Rum desert. We feel very privileged and blessed. Being born and raised in one of the world most beautiful places. We love our homeland, Wadi Rum desert. We live a settled but traditional life in Rum village in the heart of the desert. Still, in our hearts, we will always be nomads. Whenever we feel restless we put our stuff in our jeep, leave home and drive into the desert. 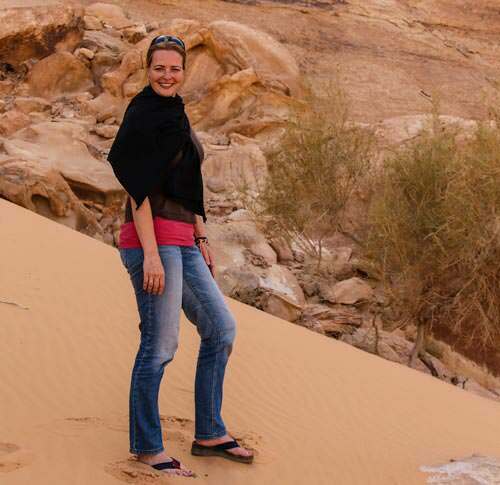 Shortly after the start of Wadi Rum Nomads, I met Bianca Abma. Eversince she part of our team. She helps us to build and grow our business. Among others she is responsible for our PR & communication. The plans for the future of Wadi Rum Nomads are simple but ambitious. It is our aim to grow Wadi Rum Nomads to become the best company in Wadi Rum desert. In order to reach this goal, we will hire and work together with the best-qualified people available. We aim to share our love for Wadi Rum desert with you. We wish to give you a unique experience. Together we make memories that will never fade. We are satisfied once we see our passion and love for our homeland in your eyes! And maybe most impressive of all; together we will experience the magic of the silence and peace of the desert night. How do we ensure your experience? Based on our extensive knowledge and experience we created a variety of tours: jeep tours, hiking & scrambling tours, trekking, camel rides. Combining tours is possible. Our trips are well balanced and give you the best experience possible. In case you have special interests or needs we are more than happy to provide you with a tailor-made program.